Drowning in email? You're not alone. The average email user spends more than a third of their day in their inbox. With almost 200 billion messages sent every day it's easy to feel overwhelmed and behind as you try to make sure you don't let emails fall through the cracks. Boomerang for Gmail lets you take control of when you send and receive messages. If you like to work late at night, you can use Boomerang to schedule emails to send in the morning. 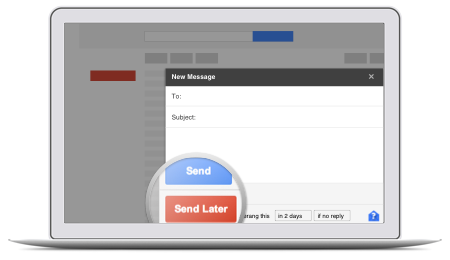 Data has shown that a well-timed email is 30% more likely to be read than a poorly-timed one. Most people check their email at the beginning of the workday, so the best time to schedule your messages is between 6-7am. Many emails don't require immediate action, even though they're important. It takes mental energy to remember when you need to respond to each one. Boomerang allows you to snooze a message out of your inbox and have it come back to the top of your inbox at the specific time that you choose so that you can take action. Boomerang can also automatically remind you when you need to follow up with someone. If a person hasn't responded to your email after a certain amount of time, Boomerang can automatically bring that email back to the top of your inbox for you so that you can follow up on it. Boomerang for Gmail enables you to send messages later, get email reminders, and snooze messages seamlessly inside of Gmail. Download Boomerang for Gmail and see for yourself why over 240,000 businesses and millions of people around the world use Boomerang to help them get and keep their inbox under control. No credit card required. Works on Chrome 5.0+, Safari 5.1+, Firefox 3.6+, Opera 15+, and Edge 39+. Works with Gmail and G Suite (Google Apps) email.